Enrique Chagoya is well known for his humorous and satirical prints, paintings, and drawings that capture many aspects and conflicts of history, culture, politics, and economics that are not often well represented in mainstream media. 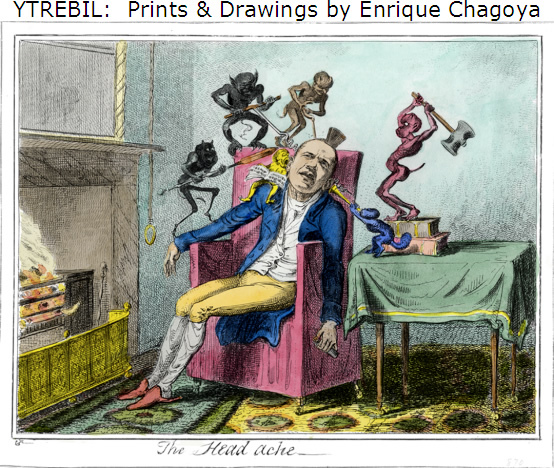 Sanchez Art Center is proud to present Ytrebil: Prints and Drawings by Enrique Chagoya from May 21 through June 13, and invites the public to an opening reception on Friday, May 21 from 7 to 9 p.m, as well as to an Artist’s Talk by Chagoya on Sunday, June 6, at 4 p.m.
Chagoya likes to work with what he calls “reverse anthropology” or “reverse art history,” wherein he considers icons, images, and symbols of the dominant culture from an outsider’s cultural perspective. History is written by the victors, not the vanquished, and often, as in the case of Mesoamerica in the 15th century, entire cultures and libraries are destroyed, and artworks and even languages lost. “What if the outcomes had been different?” Chagoya asks. As he points out, this is merely reversing the longtime practice in the field of Western high art of appropriating the artistic expressions of indigenous peoples, as, for example, Picasso incorporated elements of African tribal art into his cubist works; Henry Moore integrated Aztec art into his figures; and Frank Lloyd Wright used features from Mayan architecture in his designs. 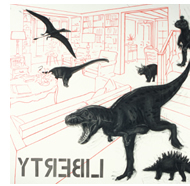 The title of Chagoya’s exhibit captures this “reverse” perspective in the term “Ytrebil,” which is “Liberty” in reverse and is incorporated in his drawing by that name. Chagoya integrates elements from cartoons, pop art, tattoo art, and the like to create deceptively easy points of entry into consideration of very complex issues. In this way he challenges viewers to think ever more deeply about humankind’s historical and cultural machinations. His newer works explore the themes of illegal immigration, racial stereotypes, and xenophobia in a post-9/11 world, and the influences of colonialism in the present. Born in Mexico City, Chagoya has lived in Europe and the United States. He credits the nurse that raised him with introducing him to indigenous Mexican history and culture, and his father with teaching him drawing and color theory at an early age. At age 24, Chagoya immigrated to San Juan, Texas, where he worked as artistic director for a literacy project for farm workers. 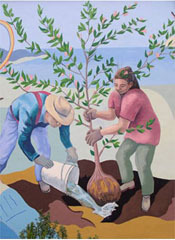 He then moved to California and began studying economics, but soon became discouraged by the limitations of this field in the U.S. and, fortunately for us, turned to art instead, earning a BFA from the San Francisco Art Institute and an MA and MFA from UC Berkeley. Now a professor in the Department of Art and Art History at Stanford University, Chagoya has received many honors, and his work has been shown nationally and internationally. In 1995 he won a residency to live and work at Monet’s Giverny gardens outside of Paris, France, and in 1999 he was artist-in-residence at the Cité International des Arts in Paris. In the fall of 2007 the Des Moines Art Center in Iowa launched a 25-year survey exhibition of his work that traveled to the Berkeley Art Museum and the Palm Springs Museum in California. His work can be found in many public collections, including the Museum of Modern Art in New York, the Metropolitan Museum, the Whitney Museum of American Art, San Francisco Museum of Modern Art, and the Fine Arts Museums of San Francisco. From 1987 to 1990 Chagoya served as artistic director of Galería de la Raza in San Francisco, whose Digital Mural Project will be exhibited concurrently in Sanchez Art Center’s East Gallery.